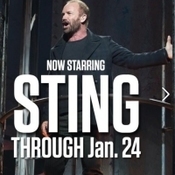 Sting's Run in "The Last Ship" Extended – Win Tickets to See Him in the Show PLUS a Meet & Greet! Enter Here! We sincerely appreciate the continued support the Sting.com fan club has shown to "The Last Ship." As a token of our thanks and to celebrate his Broadway run, we're giving away several pairs of tickets plus post-show meet & greets with Sting! Tickets will be offered for the performance on Thursday, January 15 only. Winners will be chosen at random.